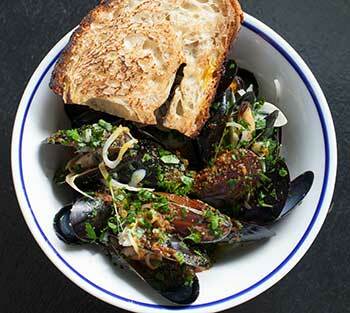 Mussels Marinieres at Petit Trois. Photo by Lucy Lean. Chef Ludo Lefebvre’s causal French bistro is set to make its Los Angeles debut next to sister restaurant, Trois Mec on July 24. Discover why these French restaurants make our list of the most recommended culinary destinations in LA! It may or may not be ironic that the year’s most buzzed about Los Angeles restaurant opening might be the smallest in size. Still, we all know that big things come in small packages—or in intimate, beautifully designed spaces perfect for 21 people. The wait is over, Petit Trois will finally make its debut on July 24. Here are five things you need to know about the new spot. Like sister restaurant, Trois Mec the celebrity chef triumvirate of Ludo Lefebvre (of LudoBites pop-up fame), Vinny Dotolo and Jon Shook (of Animal and Son of a Gun) are partnered in the enterprise, with Sydney Hunter manning the kitchen as Chef de Cuisine. Famed Estee Stanley Designs set styles on the cozy bistro, laying down black-and-white tiled floors, marble counter tops, wood accents and strictly bar stool seating for 21 people. When you’re in the middle of it all you feel like you’re somewhere south of Houston Street or on the Rue des Martyrs. While there’s no doubt droves of foodies will line up for dinner service of classic French fare like steak frites, moules frites, beef tartar, and confit of chicken leg; casual diners will rejoice in the restaurant’s lunch sandwich service. Starting at 12:30 p.m. you can stop by to take your pick from two sammies offered daily (selections will be announced on the Petit Trois website and twitter, 200 will be made each day). Kicking off the service expect the Pan-Bagnat, a classic from the south of France that mingles tuna, olives, eggs and raw vegetables; and France’s no. 1 sandwich, the Jambon-Beurre, a simple combination of perfect bread, perfect butter and perfect ham. All transactions must be made with a credit card and an 18% service charge will be added to all items. Starting out, the restaurant will be open Monday-Friday from 12:30 p.m.-midnight. Dinner and bar service begin at 5:30 p.m., and 10 p.m. is the cutoff for the full dinner menu. After 10 p.m. you can still drink and feed your munchies with croque monsieurs. By the fall, the restaurant expects that service will be extended to seven days a week, with extended evening bar service on the weekends.